Mark Milley has served three tours in Afghanistan and would become the country's senior military adviser to the president if confirmed. WASHINGTON — President Trump said Saturday that he will nominate Army chief of staff Mark Milley as the next chairman of the Joint Chiefs of Staff, replacing Marine Gen. Joseph Dunford, with the date of the transition still to be determined. Milley, who has served in Afghanistan, Iraq and Somalia, would become the country’s top military officer and senior military adviser to the president if confirmed by the Senate. He’d be responsible for helping to ensure that Trump’s policies in global hot spots are carried out. One issue high on Milley’s agenda will be the 17-year war in Afghanistan, now the nation’s longest armed conflict. The Massachusetts native and Princeton University graduate knows that battlefield well: he’s served three tours in Afghanistan and was as the deputy commanding general for U.S. Forces-Afghanistan. He’s also served in Panama, Haiti and Bosnia-Herzegovina. Milley would also be responsible for helping the military carry out the priorities in Trump’s National Defense Strategy, which calls for an emphasis on the potential for “great power” conflict with countries like Russia and China over a focus on counterterrorism. Milley addressed the shift in priorities at an April hearing on Capitol Hill. Milley, 60, would replace Dunford, who was first picked by President Barack Obama in 2015 and reappointed by Trump two years later. Dunford’s term is due to expire in 2019. Under a 2017 law, the term for the chairman of the Joint Chiefs will be increased to four years from two. 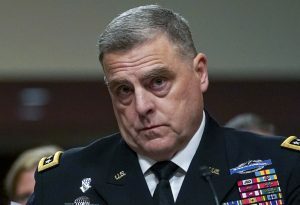 As Army chief of staff, Milley joined other senior military leaders in issuing what was interpreted as a subtle rebuke of Trump in August 2017, when the president blamed “both sides” for violence at rallies in Charlottesville, Va., when a white supremacist rammed his car into a crowd, killing a woman.